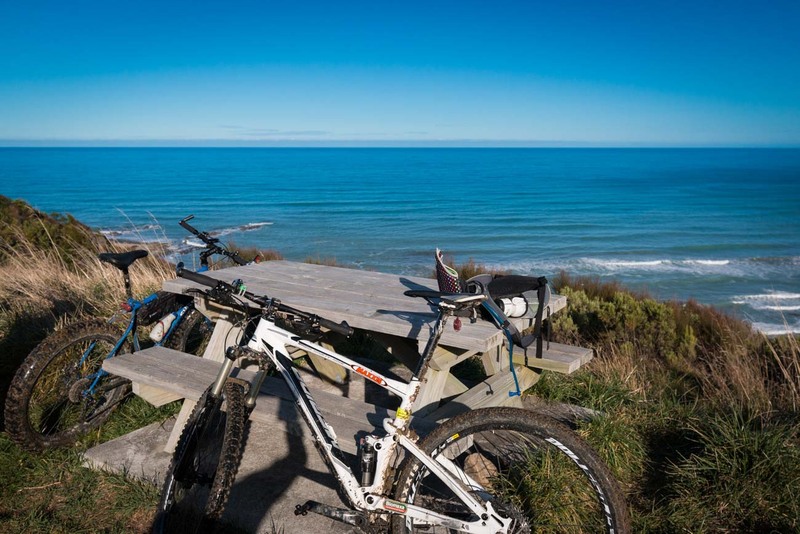 Mountain Biking the Okiwi Bay loop, 90 odd kilometres south of Blenheim on State Highway 1, had been on my to-do list ever since escaping Auckland. 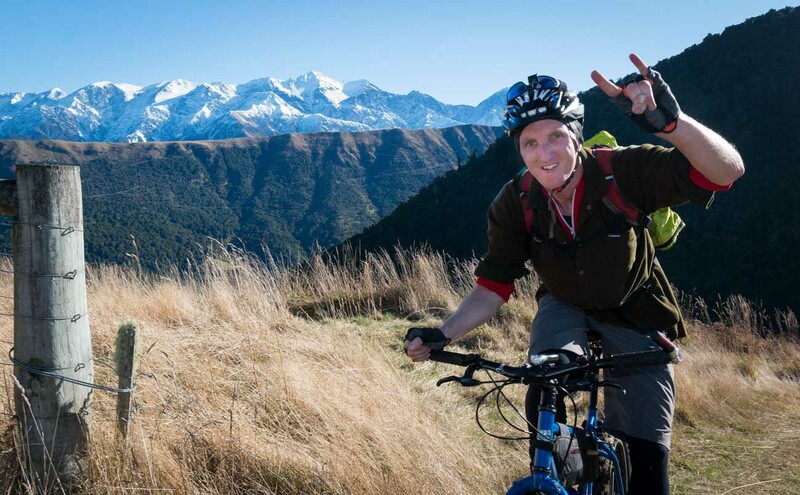 Travelling frequently to & from Kaikoura, the unconquered route had often taunted me. So when the opportunity to rectify this arose, I pulled out the stops to make it. (And with a newborn in the house, those stops were considerable). Parking the truck at Okiwi Bay, we began with a pleasant 7km warm up along the picturesque highway to the trail head at Half Moon Bay. Despite the winter chill we warmed up quickly as our progress was expedited by the stench of hundreds of basking seals. It was good to escape the highway traffic and plunge into beautiful native bush. But immediately the trail revealed its intentions. Anyone who likes their cycling served gentle should give the Half Moon/Okiwi circuit a very wide berth. There’s simply no flat sections. A dormant winter and a stark loss of fitness provided the initial challenge. Rest stops were thus plentiful as we enjoyed the peaceful location. Occasionally we’d catch a glimpse through the canopy of the calm blue Pacific, and as we toiled ever skyward, the imposing Seaward Kaikoura Range deigned to reveal its majesty. However, a danger lurked in the shadows – the dreaded Ongaonga, or Tree Nettle. With a sting capable of causing convulsions and blurred vision (effects not dissimilar to my state at the top of the climbs), we gave the peril a wide berth. The circuit has two major climbs, with the crest of the first providing the perfect place for lunch. 500 metres up, the vista was spectacular. Snowy peaks soared to the east while an endless ocean shimmered westward. Thus far, the ride was tough but not remarkably so. That would change. With full bellies we started our descent, our tyres skidding amidst the shaded frost. The temptation was to yield to the power of gravity but hazards abounded. Long thick grass veiled threats of wheel-destroying boulders, and sharp slippery corners gave way to sheer drop offs. 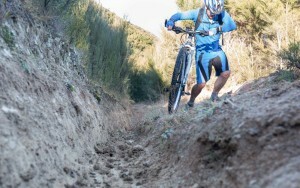 Recent downpours had conspired to transform the surface into a glutinous mess, the mud working in conjunction with deep ruts to dictate the bike’s direction. Amidst such terrain mishaps were inevitable. Seeking adrenaline infused rewards after the punishing climb, I surrendered to the speed and at one point landed face-first in a bush, well separated from my bike. The machine was some distance down the trail, still functioning but with the metal bottle cage shorn clean off. 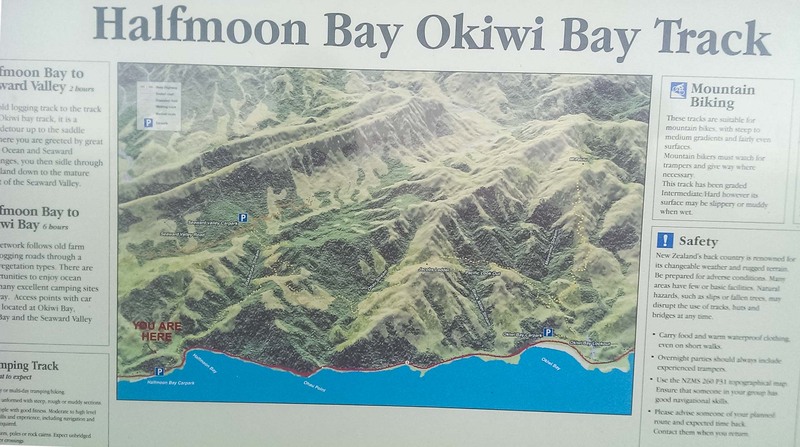 We crossed the Ohau stream and hence began the second major climb. This one was even tougher, with deeper ruts (caused by hunters and their quad bikes apparently) and ever more clogging mud. If being forced to dismount signals defeat, then that climb well and truly humiliated us. Traction was the problem; we were all trudging, even those of us equipped with 4 inch tyres. Finally the boggy ruts diminished and I was able to remount and huff & puff my way to the top. Rounding a corner near the saddle I encountered the most serious danger so far, and a true fear for all back country explorers – the barrel of a gun, pointed in my direction. Despite my animalistic gasping, bright blue lycra on wheels does not suggest an item for the dinner plate and the rifle was lowered. A couple of youths on a quad bike showed me the wild sheep they had executed, and, after warning them of more riders coming, we parted ways. It was all downhill from here. A small detour up to a 541m high lookout is an option, but a weariness was setting in and creature comforts were calling. 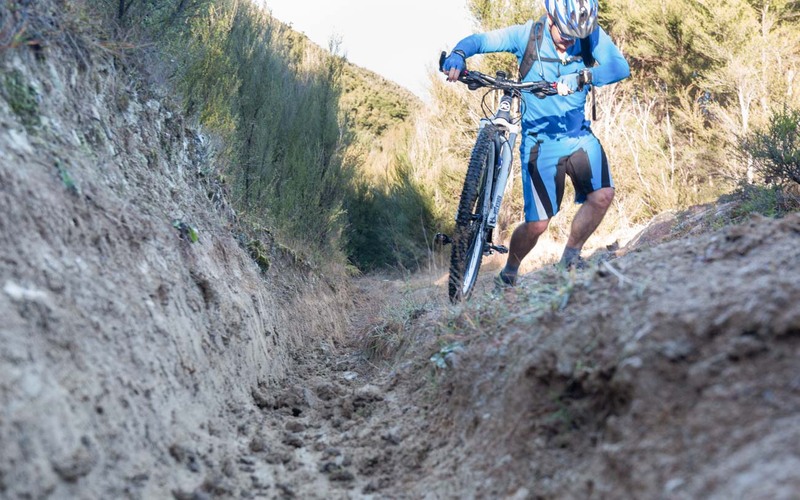 The final descent is perhaps the most treacherous, with all the ingredients for high velocity carnage on offer – large rocks, steep sections, greasy tramline ruts and mounting exhaustion. It was with relief when, with only minor casualties, we arrived at a picnic table above the carpark denoting the ride’s conclusion. It was great to experience such a wild route and a landscape quite different to the Marlborough norm. No longer would I traverse SH1 and gaze wonderingly at the Okiwi Bay circuit. Although, whether or not it had been conquered remained moot. Plans are however being formed. Summer will rob the trail of its primary weapon, the sludge. We’ll be stronger. Revenge will come.